Since 2013, scientists have suspected they gave off enough energy to ionize hydrogen floating between galaxies. This is no small feat. It’s not that hard to strip an electron from a hydrogen atom, but most galaxies have so much dust and debris that their radiation doesn’t make it into intergalactic space. So how could the galaxies that existed at the time be capable of emitting sufficient energy to reheat the entire universe? 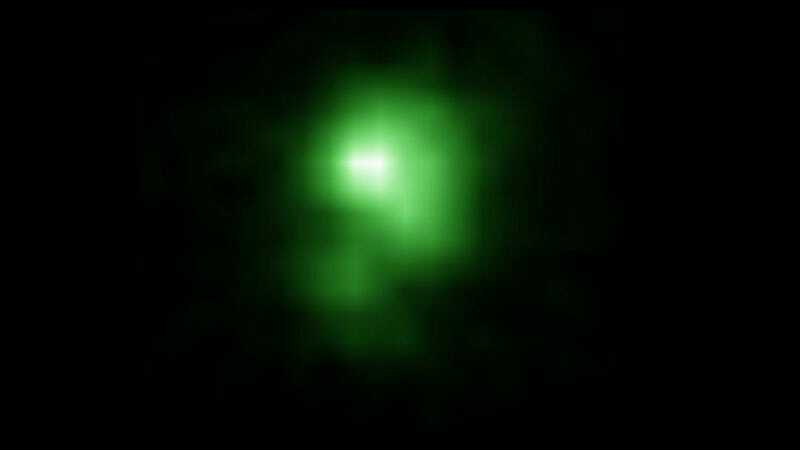 To prove green pea galaxies were different, the Swiss researchers pored over the SDSS data and found 5,000 of them. Then they selected five green pea galaxies among the 5,000, and studied them with the Hubble Space Telescope. And they found that one of those galaxies, J0925, isn’t just leaking photons capable of ionizing hydrogen—those photons are actively being ejected. Then, when the universe was about a billion years old, the green pea galaxies went to work. They formed stars quickly and violently. The star explosions and galactic winds in the green pea galaxies ejected enormous amount of energy off into space, stripping electrons off atoms once again and causing the great cosmic deionization, thereby reheating the universe.